It's apple week in the Chocolate Shavings kitchen! For some odd reason, I had never really been apple picking. I have a distant memory of my parents taking me to this farm once outside of Paris and picking a couple apples and learning how to make bread, but it wasn't exactly the same adventure. It was raining pretty heavily this weekend but we decided that apples would be picked, rain or shine. When we got to the farm, I was in awe. There's just something about picking the apple straight from the tree. It might seem like an obvious statement, but it's easy to disconnect yourself from where your food comes from, even at the farmer's market. Seeing this plump tree full of ruby red goodness made me giggle. Tugging at each apple to see if it was ready to leave its home, and tasting the different types of apples, their varying sweetness and tartness. It was a moment of pure bliss. For my first recipe of apple week, I made apple pudding. I adapted the recipe from Delicious magazine, with a couple tweaks. 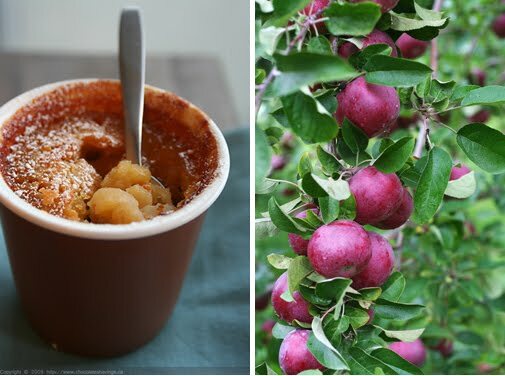 I have about 60 apples calling my name in a big basket.. so be prepared for a lot more apple-themed recipes in the days to come! In a small bowl, combine the apple pieces, lemon juice and zest, cinnamon and half of the brown sugar. Set aside. In a another bowl, using an electrical mixer, beat the butter and the rest of the sugar (about 2 minutes). Add the the egg and vanilla extract until just combined. Slowly add in the flour until just combined. Divide the apple mixture into 4 individual ramekins and add a spoonful of the flour mixture ontop. Bake for 40-45 minutes. Enjoy! wow...this sounds amazing, i bet it just made the house smell simply delish!! Apple Pudding!! Wow, way to think outside the box on the first apple day! I would have posted my pie but it didn't make it past 24 hours... I really want to try this puddin, hopefully I'll get the chance this weekend if the apples are still around. Apple pudding sounds delicious. I've never heard of it. I love anything with cooked apples so I will definitely try this recipe out. thanks for posting this. There are few things as tasty as eating an apple straight from the tree. that pudding looks amazing! i love apples and can't wait to try it. Oh, I am SO making this as soon as I get my hands on some apples. Looks amazing!!! anna: I agree! I'm thinking of going back very soon - there are still plenty of apples to be picked before the season is over! apple picking just outside of paris? oh you lucky little one! never heard of apple pudding, but so glad I have. I've never been apple picking either. I need to find a place around here and take my children! I'm certain they'd love it! Thanks for sharing the experience and recipe! That sounds delicious and exceptional, too. I am always looking for new apple recipes and this is really a special one. I´ll definitely give it a go! You list 50 grams of butter twice - is that correct? Anonymous: No, just once! Thanks for noticing! I love this!! The pics are beautiful! Apple pudding sounds so amazingly good! WOw, apple pudding sounds really interesting! Looks really good. Apple pudding! Yum yum yum yum yum. And lovely photos as always. I made this tonight and it was delicious! Used 3 med apples, 2 fuji and one granny smith. Took a meyer lemon from my tree. Cheated with the mixer, microwaved the butter (turned out to be about 1/2 stick) for 20 secs and mashed with a fork. This is impossible to make as written. It calls for 2 1/4 c. brown sugar, but mentions sugar twice: both in the topping and in the batter. How much sugar goes into each?! Anonymous: Typo is corrected, should be easy to make now! Is it okay to sub regular sugar for brown sugar? I don't have any! Anonymous: I find that brown sugar has a little more flavor here because of the added molasses, but you can definitely make it with white sugar if you don't have any brown sugar on hand.